This is my first post for December and I couldn't be more excited because I can finally start breaking out some of my holiday favorites! For example, I totally love buffalo check patterns around the holidays. It's a little more versatile than some plaid fabrics that scream "It's Christmas time! ", yet it's still festive. 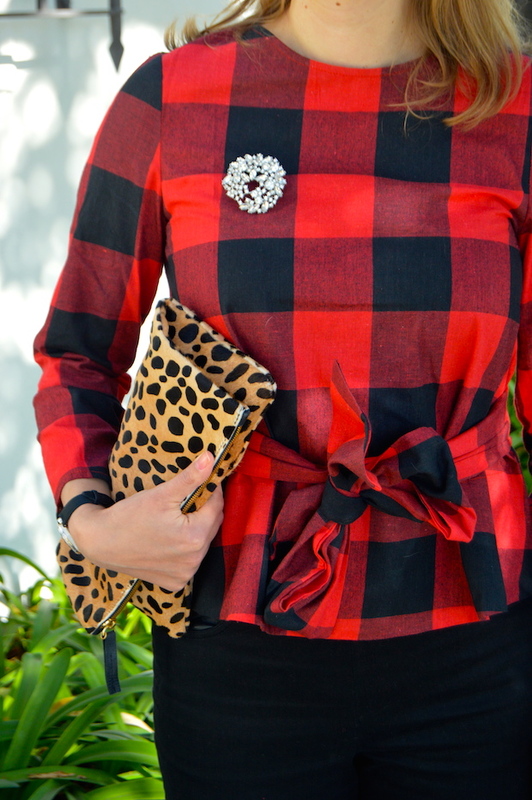 This is why I was so excited when I found this buffalo check top from SheIn! My favorite aspect of the top, aside from the print, is that it features a cute bow sash. Also, like most everything on the SheIn website, it's a super bargain at only $15, so you really can't go wrong! Because the bow wasn't enough in the detail department for me, I added even more visual interest with this great brooch I got last year at Banana Republic. While it's no longer available, Banana Republic does have a great selection of brooches again this year for the holiday season and I've linked to some of my favorite options below. I wore this outfit to go to a fun holiday "open house" at an Italian specialty grocery store and restaurant. They had free samples of cheese, homemade bread, olives, desserts, and, best of all, wine! Between wearing my festive buffalo check blouse and tasting some holiday treats, it was a great way to get in the mood for Christmas. Now on to getting and decorating a tree next week! Yes I totally agree with you about buffalo prints. It does say festive but not overwhelming. I love that you added a brooch for an extra added detail to your outfit which btw looks amazing with your shoes! This top is so cute and I love the brooch! I feel like I should go through my mom's stash now! Put all her brooches to good use! I just love buffalo check for the holidays! Gorgeous look, love the brooch and pops of silver and leopard! I love red buffalo plaid an your top is gorgeous, a steal too. It looks so well made. The addition of the leopard clutch, your elegant brooch, fancy watch and silver loafers made this perfect for the holidays. I love BR's brooches and own a few myself. Also, I would have loved that food+drinks sample event at the grocery store wow.